It’s everybody else, one way or another. Hospitals write off charity care and bad debt. In Idaho, as in many other states, county and state governments also pick up unpaid tabs. There are surely differences in quality, effectiveness and ethics among different health care approaches. There are certainly nobler reasons to want a system that gives access to everyone. But when patients can’t pay their bills, the costs are every bit as socialized when uninsured people get sick and wind up in the ER as they are when the government subsidizes their health insurance. If you look at the experiences of Idaho and Washington in the years since the adoption of the Affordable Care Act, you see that very clearly. In Washington, a state that expanded Medicaid coverage under Obamacare, the amount of “uncompensated care” at hospitals – charity care and bad debt, absorbed and passed along by the hospitals to other patients – has plummeted. Charity care at Washington hospitals, which are required to provide free care for very poor patients, dropped 44 percent in 2015, which followed a 34 percent drop the year before, according to the state Department of Health. As a proportion of all patient services revenues, charity care dropped from 2.9 percent in 2013 to 0.9 percent in 2015. Meanwhile in Idaho, hospitals, county governments and the state are picking up the tab when patients can’t pay. A direct comparison to the Washington figures wasn’t available, and the charity care requirements differ between the states. But there’s a strong argument to be made that the state would save money if it covered more citizens under the dreaded Obamacare. Idaho, of course, didn’t expand Medicaid coverage. About 78,000 Idahoans live in that gap, making too much money to qualify for an ACA subsidy and too little to qualify for traditional Medicaid. Idaho’s politicians have so steadfastly refused to help those people that citizens had to turn to the initiative process to put Medicaid expansion on the ballot. Research shows clear differences between the two approaches across the country. States that expanded Medicaid saw a drop of 40 percent in uncompensated care and a 37 percent drop in uninsured hospital stays in the two years after the ACA was adopted, according to an analysis by the Georgetown University Center for Children and Families that is cited by proponents of Medicaid expansion in Idaho. In states that didn’t expand Medicaid, there was a 6 percent drop in uncompensated care, and a 3 percent reduction in uninsured hospital visits. In both cases, somebody paid when the patient couldn’t pay. In both cases, that somebody was everybody else. The ACA is much-hated in some quarters, for both its problems (uncontrolled costs) and, ironically, for its successes (insuring more people through the big, bad government). But it’s a misbegotten fantasy to believe that if we don’t share costs through the ACA, that we don’t share them in other ways. Idaho, which is perhaps the most Obamacare-resistant environment on earth, proves it. A state fund has been set up to help cover costs for people who can’t pay. This fund for indigent care paid $36 million to cover bills for 3,795 people in 2015, according to a financial impact study conducted for the state. Proponents of Medicaid expansion note that if the state were to invest $72 million to expand Medicaid, 117,000 Idahoans could be insured. On a per-person basis, this would be an exponentially better deal, of course, even if all you cared about was the expense. Idaho could cover 31 times more people for twice the cost. But closing the Medicaid gap there would actually be an even better financial choice for the state, proponents argue. 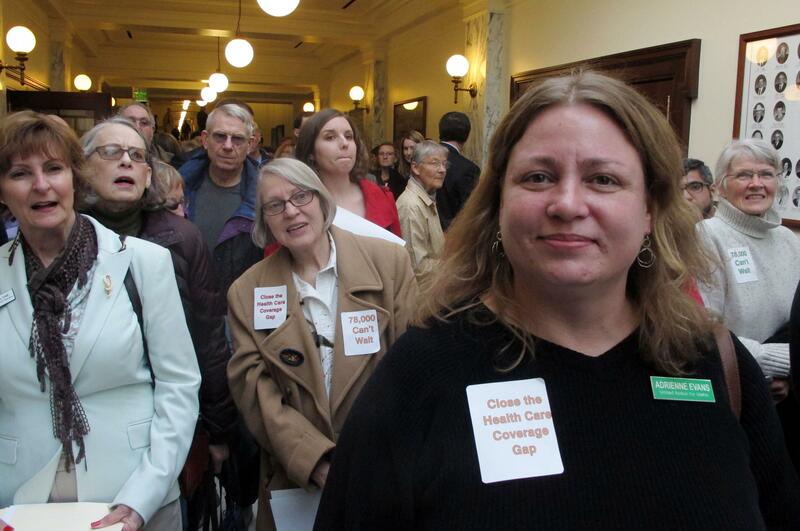 Close the Gap Idaho, a network of 300 health care organizations and individuals, cites data commissioned by a state health care task force showing that if Idaho were to expand Medicaid, it would spend $358 million over the subsequent five years. That would be a savings of $165.5 million, because it would eliminate indigent coverage and state programs, and add new tax revenues. In other words, closing the gap would be both humane and fiscally sound. Because like it or not, somebody pays when the patient can’t. Published: May 6, 2018, 6 a.m.